You must be a member of the Mexico City Bike Lovers Group to attend this activity. Would you like to join this group? 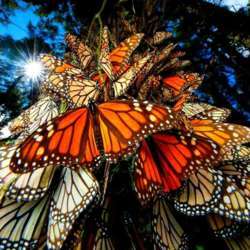 We’re going for a bike ride to see the infamous and splendid Monarch butterflies in the beautiful forests near Valle de Bravo. Our guide, Miguel is a biologist by training, and lover of Mexico from birth. On this tour, we will have a mix of easy trails for beginners to moderate trails for more intermediate riders. I organized this trip initially to go on a family getaway with my cousin, but thought it might be fun to share the adventure with my Internations family. A little about your guide: Miguel. Miguel and his partner Mirna are cycle enthusiasts and adventure loving Mexicanos. They love the environmental splendor of Mexico and have decided to help others enjoy Mexico whilst supporting micro-economies and environmentally responsible businesses. Thus, they started Chaa’ Mexico with the aim of working with locally owned proprietors that share a mutual respect and love for the rich, green and living treasures of Mexico. Miguel and Mirna lead adventures that are off the beaten path, and give participants an opportunity to know Mexico’s people who don’t always get to be part of the tourist economy. We will be meeting at Chaa’ Mexico’s humble offices at the address below. Miguel and Mirna assure us that parking on the street will not be a problem and there is little safety risk as the neighborhood is very safe and neighbors all support each other and the mission of Chaa’ Mexico. Weekend parking is free, and the fee for Friday night should be less than $50 mxn. From there, Miguel and Mirna will arrange transport for us and our bikes to our accommodations near the town of Valle de Bravo in the Estado de Mexico. Friday night we will arrive and have a chance to grab food and drinks in the town. Saturday morning we will begin our scenic bike ride for a full day of adventure and butterflies. In the evening, we will relax at the lodge or have the opportunity to go into town again to enjoy the evening there. Sunday, we will have another opportunity to bike in the forest or spend more time in Valle de Bravo before we load up and come back to Mexico City. Because Valle de Bravo is very busy this time of year, deposits of 1/2 of your package must be made no later than January 25th. Full payment must be received by Feb 8th. Use Miguel’s account information (below) to make your deposit and send him a Whatsapp or text message with your name so he can register you on the attendance list. Don’t have a bike? Select a package that includes a bike rental!